The following is a short extract from the great stories of our Lord Krishna (कृष्ण) which caught my eyes for a very long time while reading an online book. Perhaps , Thats the “mahima” of our Lord Krishna !! 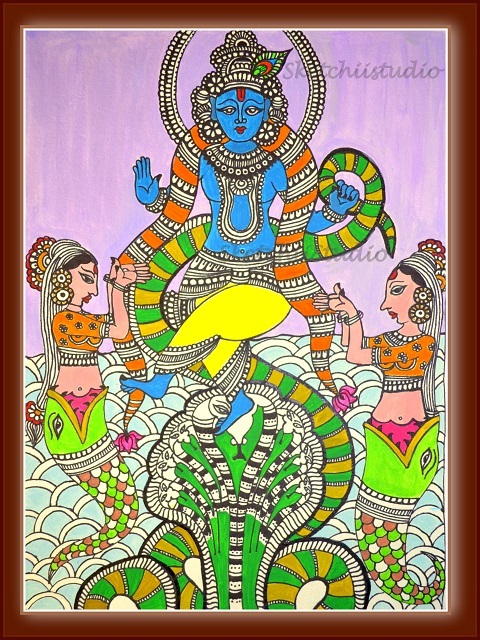 I am sharing today the story of Krishna, and the many-hooded serpent demon Kaliya, which is very well known. I tried to make the scene using some bright colors. I began with the pencil Sketch. That’s the first pic I took. 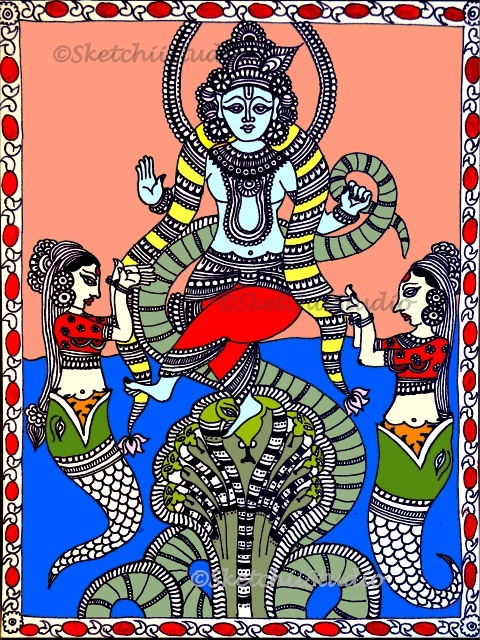 Kaliya (कालिय) was the name of a poisonous Naga living in the Yamuna River, in Vrindavan. The water of the Yamuna for four leagues all around him boiled and bubbled with poison. This created a great problem for the residents of Vrindavan and their cows. No bird or beast could go near, and only one solitary Kadamba tree grew on the river bank. The proper home of Kāliya was Ramanaka Dwipa, but he had been driven away from there by fear of Garuda, Garuda had been cursed by a yogi dwelling at Vrindavan so that he could not come to Vrindavan without meeting his death. Therefore Kāliya chose Vrindavan as his residence, knowing it was the only place where Garuda could not come. Once Krishna and herdboys were playing ball, and while playing Krishna climbed up the Kadamba tree and hung over the river bank, the ball fell into the river and Krishna jumped after it. This enraged the hideous monster Kaliya & he rose up with his hundred and ten hoods vomiting poison and coiled around Krishna’s body. But then Krishna soon was reminded of His divine powers and exercising His powers He uncoiled Himself from the serpent and forthwith climbed up the hoods of Kaliya and assumed the weight of the whole universe. The pressure of Krishna’s feet crushed the towering pride of the myriad-hooded monster. When the heels of Krishna strike the hoods, some break off and then got replaced by new ones. All this while Krishna keeps playing his sweet flute. Kaliya lowered his hoods and vomited blood. But the Dance of Krishna did not cease. Snake Kaliya with its numerous hoods symbolizes the numerous desires we have. When one desire gets fulfilled, another arises, like the new hoods of Kaliya. The hoods keep breaking and forming, but Krishna is unperturbed. He keeps playing His flute, denoting the power of discrimination, of wisdom, of the focus on the bliss of Self. Kaliya was found tottering towards death when his wives came out of the river and with palms joined in prayer begged Krishna to spare the life of their husband. I usually read the complete story before attempting to make it. However, I have heard of this tale quite a few times as it is a famous one. I had in my mind a complete picture of what I was going to draw. It took me 3 Hrs to complete the sketch. I was ready with the Black and White look of my sketch. It was gorgeous !!! The prayers of the wives of Kaliya who had faith in Krishna moved the Son of Nanda to have mercy on Kaliya. Krishna now desisted from His terrific Dance on condition that Kaliya was to quit the river at once and to betake himself to his original home in the island of Ramanaka. Krishna assured Kaliya that after seeing the marks where He had touched Kaliya’s head with His lotus feet, Garuda will not disturb Kaliya, as Garuda would respect the print of Krishna’s Feet on hoods of Kaliya. The water of the River was now rendered immune from all poison and became as sweet as it was before the advent of Kaliya. Kāliya, recognizing the greatness of Krishna, surrendered and promised he would not come to Vrindavan again and would not harass anybody. So Krishna pardoned him and then let him go free to leave the river and go to Ramanaka Dwipa.